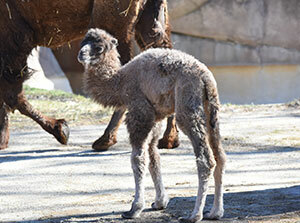 Camel Calf Born on Exhibit! 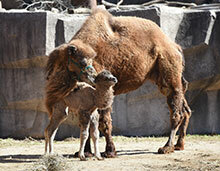 Zoo visitors got quite a surprise on Sunday, March 5, when they witnessed Bactrian camel, Sanchi, give birth to a calf on exhibit! The camel calf, who was named Patrick in honor of the upcoming Saint Patrick’s Day holiday, weighed about 100 pounds at birth and was walking less than two hours later! Camels have a rather long gestation of 13 months. Sanchi has given birth to several calves before and is quite accustomed to motherhood, but this is the first calf for dad, Stan. Accordingly, zookeepers are keeping Stan separate from Patrick until they can better assess his anticipated behavior near the calf. Big sister, AJ, also isn’t quite sure what to make of this new addition to the group, and has been keeping her distance for now. Keepers report that Patrick is extremely confident with loads of personality – for only being a day old at the time, Patrick was quite a handful during his first veterinary medical exam! Keepers are currently working on desensitizing Patrick to touch so that his feet, ears and other areas can be more easily examined by veterinarians as he grows. For enrichment and as an outlet for his boisterous energy, keepers have been providing Patrick with “jolly balls” commonly used with horses, which he very much likes to kick at. Patrick is currently nursing from mom but will soon begin exploring solid foods – such as hay, pellet mix, carrots and apples. There are currently three species of camels: the one-humped dromedary, the domestic two-humped Bactrian camel and the wild Bactrian camel. Wild Bactrian camels are listed as critically endangered, primarily due to hunting and development associated with the mining industry in China and Mongolia. The Zoo hopes its Bactrian camels – including newest member, Patrick – can serve as ambassadors for the declining wild camel population. Although the schedule may fluctuate, Patrick is usually on exhibit for several hours beginning at about 10 a.m. daily. He tends to be most active in the morning, so that is an ideal time for visitors to see him. 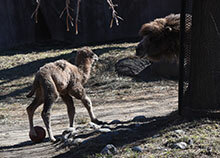 Stop by the outdoor Camel Yard on your next visit to the Zoo to meet Patrick!